February 6th marks the Anniversary of Her Majesty Queen Elizabeth II becoming the first queen regnant of the United Kingdom and the Commonwealth Realms since Queen Victoria upon the untimely demise of her father, George VI. The traditional 41-gun and 62-gun Royal Salute to mark accession day also took place at noon at Hyde Park Corner and at the Tower of London by The King’s Troop Royal Horse Artillery the Honourable Artillery Company as is tradition on accession day. A Royal Salute is normally 21 guns, but this is increased to 41 if fired from a Royal Residence and 62 rounds are fired from the Tower of London on Royal anniversaries. On her accession Queen Elizabeth became Head of the Commonwealth and queen regnant of seven independent Commonwealth countries: the United Kingdom, Canada, Australia, New Zealand, South Africa, Pakistan and Ceylon. From 1956 to 1992, the number of her realms varied as territories gained independence and some realms became republics. At present, in addition to the first four aforementioned countries, Elizabeth is Queen of Jamaica, Barbados, the Bahamas, Grenada, Papua New Guinea, the Solomon Islands, Tuvalu, Saint Lucia, Saint Vincent and the Grenadines, Belize, Antigua and Barbuda and Saint Kitts and Nevis. Her reign of more than 60 years is currently the longest for a British monarch, Having surpassed the length of Queen Victoria’s reign in 2016. 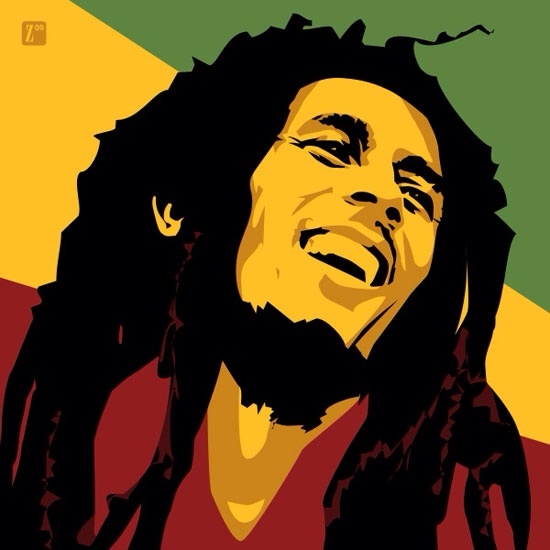 Singer songwriter and Reggae Legend Bob Marley was born 6 February 1945 in Nine Mile, Saint Ann Parish. He attended Stepney Primary and Junior High School. In 1955, when Bob Marley was 10 years old, his father died of a heart attack at the age of 70. Marley met Neville Livingston (later known as Bunny Wailer) while at Nine Mile and they started to play music together while at Stepney Primary and Junior High School.Marley left Nine Mile with his mother when he was 12 and moved to Trenchtown, Kingston. Cedella Booker and Thadeus Livingston (Bunny Wailer’s father) had a daughter together whom they named Pearl, who was a younger sister to both Bob and Bunny. While Marley and Livingston were living in Trenchtown, they played the latest R&B from American radio stations broadcasting in Jamaica, and the new Ska music and joined a vocal group with Peter Tosh, Beverley Kelso and Junior Braithwaite. Joe Higgs, who was part of the successful vocal act Higgs & Wilson, resided on 3rd St., and his singing partner Roy Wilson had been raised by the grandmother of Junior Braithwaite, so they met Higgs and Wilson who helped them develop their vocal harmonies, and Higgs also taught Marley how to play guitar. In February 1962, Marley recorded four songs, “Judge Not”, “One Cup of Coffee”, “Do You Still Love Me?” and “Terror”, and by 1963, Bob Marley, Bunny Wailer, Peter Tosh, Junior Braithwaite, Beverley Kelso, and Cherry Smith were called The Teenagers. They later changed the name to The Wailing Rudeboys, then to The Wailing Wailers and finally The Wailers and achieved international fame through a series of crossover reggae albums and singles like “Simmer Down”. Soon The Wailers found themselves working with established Jamaican musicians such as Ernest Ranglin (arranger “It Hurts To Be Alone”),the keyboardist Jackie Mittoo and saxophonist Roland Alphonso. By 1966, Braithwaite, Kelso, and Smith had left The Wailers, leaving the core trio of Bob Marley, Bunny Wailer, and Peter Tosh.In 1966, Marley married Rita Anderson, and moved to Wilmington, Delaware in the United States where he worked as a DuPont lab assistant and on the assembly line at a Chrysler plant. Though raised as a Catholic, Marley became interested in Rastafarian beliefs in the 1960s, and After returning to Jamaica Marley formally converted to Rastafari and began to grow dreadlocks. The Rastafarian proscription against cutting hair is based on the biblical Samson who as a Nazarite was expected to make certain religious vows After a financial disagreement with Dodd. Between 1968 and 1972, Bob and Rita Marley, Peter Tosh and Bunny Wailer experimented with some old tracks to make them sound more pop orientated rather than reggae, in order to break Marley into the American charts. Marley also adopted a Doo-wop style on Stay With Me and a slow love song style on Splish for my Splash. In 1972, Bob Marley signed with CBS Records in London and embarked on a UK tour with American soul singer Johnny Nash. While in London the Wailers signed to Island Records and were asked to record an album. So The Wailers returned to Jamaica and recorded the album Catch A Fire at Harry J’s in Kingston they were the first reggae band to have access to a state-of-the-art studio which resulted in a better sound. Catch a Fire had a drifting hypnotic feel rather than a Reggae Rhythm and was released in1973. It was followed by the album Burnin’ which included the song “I Shot the Sheriff”. Eric Clapton was given the album by his guitarist George Terry and was impressed enough to record a cover version of “I Shot the Sheriff” which became a hit in 1974. The Trenchtown style music of Burninfound appealed to fans of both reggae and rock. The Wailers also toured alongside Sly and the Family Stone but were fired because they were more popular than the acts they were opening for. Sadly the Wailers disbanded in 1974, however Marley continued recording as “Bob Marley & The Wailers”. His new backing band included brothers Carlton and Aston “Family Man” Barrett on drums and bass respectively, Junior Marvin and Al Andersonon lead guitar, Tyrone Downie and Earl “Wya” Lindo on keyboards, and Alvin “Seeco” Patterson on percussion. With The “I Threes”, consisting of Judy Mowatt,Marcia Griffiths, and Marley’s wife, Rita, providing backing vocals and In 1975, Marley had his international breakthrough with his first hit outside Jamaica, “No Woman, No Cry”, from the Natty Dread album. this was followed by his breakthrough album in the United States, Rastaman Vibration (1976). In December 1976, Marley, his wife, and manager Don Taylor were wounded by an unknown assailant inside Marley’s home, shortly before “Smile Jamaica”, a free concert organised by the Jamaican Prime Minister Michael Manley to ease rival Political tensions, Taylor and Marley’s wife sustained serious injuries, and Bob Marley received minor wounds in the chest and arm.The attempt on his life was thought to have been politically motivated. Despite his injuries Marley performed at Smile Jamaica! When asked why, Marley responded, “The people who are trying to make this world worse aren’t taking a day off. How can I?” The members of the group Zap Pow played as Bob Marley’s backup band before a festival crowd of 80,000 while members of The Wailers were still missing or in hiding.Marley left Jamaica at the end of 1976, and spent two years in self-imposed exile in England. in England, he recorded the albums Exodus and Kaya which included the singles: “Exodus”, “Waiting in Vain”, “Jamming”, and “One Love” (a rendition of Curtis Mayfield’s hit, “People Get Ready”). While In London, he was arrested and received a conviction for possessing cannabis.In 1978, Marley returned to Jamaica and performed at another political concert, the One Love Peace Concert, then In 1979 Marley released Survival, a defiant and politically charged album, and songs such as “Zimbabwe”, “Africa Unite”, “Wake Up and Live”, and “Survival” reflected Marley’s support for the struggles of Africans. His appearance at the Amandla Festival in Boston in July 1979 showed his strong opposition to South African apartheid. In July 1977, Marley was found to have a type of malignant melanoma under the nail of a toe. Marley turned down his doctors’ advice to have his toe amputated, citing his religious beliefs. Despite his illness, he continued touring and released the The album Uprising in May 1980 featuring “Redemption Song”. The band completed a major tour of Europe and Marley performed two shows at Madison Square Garden as part of the Uprising Tour. Bob Marley appeared at the Stanley Theater (now called The Benedum Center For The Performing Arts) in Pittsburgh, Pennsylvania in September 1980 which was his last concert. Soon after Marley’s health deteriorated so he sought treatment at the Bavarian clinic of Josef Issels, where he received a controversial type of cancer therapy without success for eight months. Tragically While flying home from Germany to Jamaica, Marley’s condition worsened and After landing in Miami, Florida, he was taken to the hospital for immediate medical attention. Bob Marley died on 11 May 1981 at Cedars of Lebanon Hospital in Miami (now University of Miami Hospital); he was 36 years old. Marley received a state funeral in Jamaica on 21 May 1981, combining elements ofEthiopian Orthodoxy and Rastafari tradition and was buried in a chapel near his birthplace with his red Gibson Les Paul. Carl Wilson, Musician with the Beach Boys sadly passed away on 6th February 1998. Born 1946 He was on of the founding member of the beach Boys along with his cousins , Brian and Dennis Wilson, and their friend Al Jardine. From an early age The Wilson family home was a musical one, and the Wilson family often sang at get-togethers. Brian and his brothers Carl and Dennis Wilson along with Mike Love and Al Jardine first gelled as a music group in the summer of 1961, initially named the Pendletones. Brian Wilson also began to experiment with recording songs after receiving a Wollensak tape recorder on his 16th birthday, which lead to the Formation of The Beach Boys, and After being encourageded by Dennis to write a song about the local water sports craze, Brian and Mike Love together created what would become the first single for the band, “Surfin’”. Brian Wilson was mainly the lead singer,, of the Beach Boys. Some of the Beach Boys’ biggest hits, include “Surfin’ Safari”, “Surfin’ USA“, “Shut Down”, “Little Deuce Coupe“, “Be True to Your School”, “Little Saint Nick”, “Fun, Fun, Fun“, “I Get Around”, “When I Grow Up (To Be a Man)”, “Little Honda”, “Dance, Dance, Dance” and “California Girls“. Love also wrote or co-wrote lyrics to many of the Beach Boys songs, mostly with the themes of surfing, cars or love, but also memorable ballads such as “The Warmth of the Sun”. Recently the remaining members of the Beach Boys also released an abum “That’s Why God Made the Radio” in 2012 to celebrate their 50th anniversary and embarked on a worldwide tour. Wilson was Inducted into the Rock and Roll hall of Fame along with all the other members of the Beach Boys. Austrian symbolist painter Gustav Klimt died in Vienna on February 6, 1918, having suffered a stroke and pneumonia due to the influenza epidemic of that year. Born July 14, 1862, he became one of the most prominent members of the Vienna Secession movement and is noted for his paintings, murals, sketches, and other art objects. Klimt’s primary subject was the female body. Born in Baumgarten, near Vienna in Austria-Hungary he displayed artistic talent early on but lived in poverty while attending the Vienna School of Arts and Crafts (Kunstgewerbeschule), where he studied architectural painting until 1883.He revered the foremost history painter of the time, Hans Makart and readily accepted the principles of a conservative training and his early work may be classified as academic. In 1888, Klimt received the Golden order of Merit from Emperor Franz Josef I of Austria for his contributions to murals painted in the Burgtheater in Vienna. He also became an honorary member of the University of Munich and the University of Vienna. He also became one of the founding members and president of the Wiener Sezession (Vienna Secession) in 1897 where he remained until 1908. The group’s goals were to provide exhibitions for unconventional young artists, to bring the best foreign artists’ works to Vienna, and to publish its own magazine to showcase members’ work.The group declared no manifesto and did not set out to encourage any particular style—Naturalists, Realists, and Symbolists all coexisted. The government supported their efforts and gave them a lease on public land to erect an exhibition hall. The group’s symbol was Pallas Athena, the Greek goddess of just causes, wisdom, and the arts—and Klimt painted his radical version in 1898. In 1894, Klimt was commissioned to create three paintings to decorate the ceiling of the Great Hall in the University of Vienna. Not completed until the turn of the century, his three paintings, Philosophy, Medicine and Jurisprudence, were criticized for their radical themes and material and caused a public outcry from all quarters—political, aesthetic, and religious. As a result, they were not displayed on the ceiling of the Great Hall. as a result This was the last public commission accepted by the artist for some time.In 1902, Klimt finished the Beethoven Frieze for the 14th Vienna Secessionist exhibition, which was intended to be a celebration of the composer and featured a monumental, polychromed sculpture by Max Klinger. Meant for the exhibition only, the frieze was painted directly on the walls with light materials. After the exhibition the painting was preserved, although it did not go on display until 1986. The face on the Beethoven portrait resembled the composer and Vienna Court Opera director Gustav Mahler. Klimt’s ‘Golden Phase’ was marked by positive critical reaction and success. 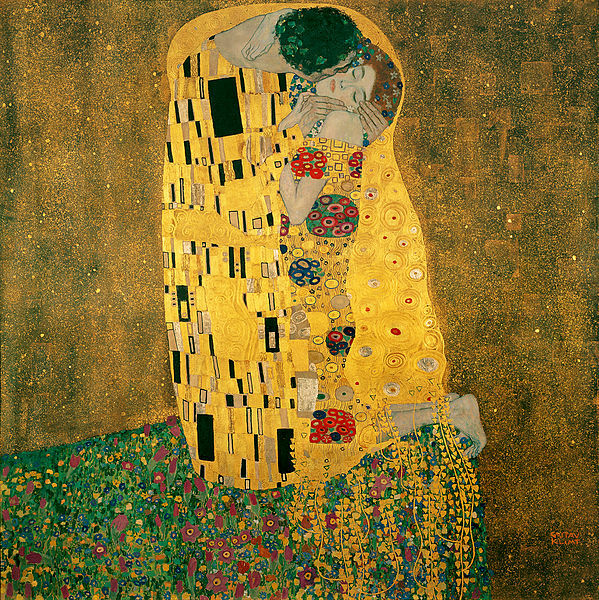 Many of his paintings from this period used gold leaf; the prominent use of gold can first be traced back to Pallas Athene (1898) and Judith I (1901), although the works most popularly associated with this period are the Portrait of Adele Bloch-Bauer I (1907) and The Kiss (1907–1908). Klimt travelled little but trips to Venice and Ravenna, both famous for their beautiful mosaics, most likely inspired his gold technique and his Byzantine imagery. In 1904, he collaborated with other artists on the lavish Palais Stoclet, the home of a wealthy Belgian industrialist, which was one of the grandest monuments of the Art Nouveau age. Klimt’s contributions to the dining room, including both Fulfillment and Expectation, were some of his finest decorative work, and as he publicly stated, “probably the ultimate stage of my development of ornament. Between 1907 and 1909, Klimt painted five canvases of society women wrapped in fur. His apparent love of costume is expressed in the many photographs of Flöge modeling clothing he designed.In 1911 his painting Death and Life received first prize in the world exhibitions in Rome. In 1915 his mother Anna died. Klimt was buried at the Hietzinger Cemetery in Hietzing, Vienna. Numerous paintings were left unfinished. However those he did finish before his untimely demise have brought some of the highest prices recorded for individual works of art. In November 2003, Klimt’s Landhaus am Attersee sold for $29,128,000, and plenty of other examples of his work have also fetched vast sums of money at auction. Following the Use Your Illusion Tour, Rose disappeared from public life for several years, while the band disintegrated due to personal and musical differences. As its sole remaining original member, he was able to continue working under the Guns N’ Roses banner because he had legally obtained the band name. In 2001, he resurfaced with a new line-up of Guns N’ Roses at Rock in Rio 3, and subsequently played periodic concert tours to promote the long-delayed Chinese Democracy (2008), which undersold the music industry’s commercial expectations despite positive reviews upon its release. 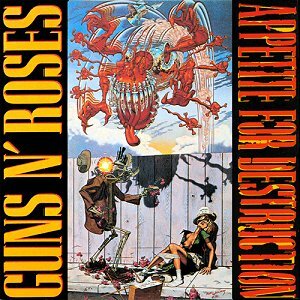 Rose joined his band in residencies at The Joint in Las Vegas in 2012 and 2014, as well as several shows in North America, Asia and South America as part of the Appetite for Democracy tour supporting the anniversaries of Appetite for Destruction and Chinese Democracy. Rose was awarded the Ronnie James Dio lifetime achievement award in 2014 by Revolver at the Revolver Golden Gods awards. According to a 2014 interview with Rose, their new album, recorded concurrently with Chinese Democracy, and a remix album were completed and pending release. In 2016, former members Slash and Duff McKagan returned to Guns N’ Roses with Rose set to headline a ‘reunited’ lineup at Coachella 2016. Rose has been named one of the greatest singers of all time by various media outlets, including Rolling Stone and NME Due to his powerful and wide vocal range and energetic live performances and in 2012, Rose was inducted into the Rock and Roll Hall of Fame as a member of Guns N’ Roses, though he declined to attend the event and requested exclusion from the HoF. Rose has also recently been the cause of more controversy after replacing Brian Johnson as lead singer of AC/DC after Johnson was forced to retire from singing on medical grounds or face the prospect of going deaf.